Go North East is giving its customers a bus ride for a 1913-style-price to celebrate 100 years since its first ever bus journey. Go North East's first bus left Chester-le-Street for Low Fell at 2pm on 7 May in 1913 under the name of the Northern General Transport Co Ltd. To mark this significant milestone, passengers have been offered the chance to hop on to its Angel bus - which now operates on this route - at exactly the same date and time, 100 years on, for the original fare of 5p. The 5p bus ride is one of a number of events Go North East is hosting to mark a century of getting north east people from A to B. The firm is commissioning a book which will be a people's history of the company. A children's book for 5-6 year olds is also set to be created, as well as special events including a summer party for its staff and stakeholders held at Beamish museum. 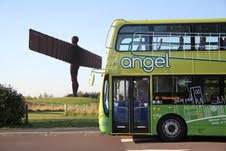 Kevin Carr, managing director, Go North East, said: “There isn't a lot you can buy for 5p these days and it's a small price to pay to be part of our special centenary bus journey. "As a company that prides itself on forward thinking and innovation, it's rare we ever look back but turning 100 is a significant achievement and milestone and it's only right that we highlight how far we've come. "We continue to move with the times and invest in new buses, new technologies, smart ticketing choices, new ways of communicating with our customers and carefully trained staff. We are delighted to still be serving this fantastic region, 100 years on."